Even if you're not exactly up to speed on your deuce courts and forty-loves, you could still do much worse than spending a few days with tennis champion Andre Agassi's autobiography, Open. Yes, first and foremost, it is the story of an athlete, but the book is equally engaging when it moves beyond the matches to reveal the man -- conflicted, flawed, and at odds with the sport he's supposed to love. Through the prose of J.R. Moehringer, of The Tender Bar fame, Agassi chronicles his pockmarked journey from berated child prodigy, to precocious, rebellious teenager, to husband, father and legend. The defining characteristic of this book is its honesty. With anecdotes (often hilarious -- if you're not easily offended, see the bottom of this post for an e.g.) 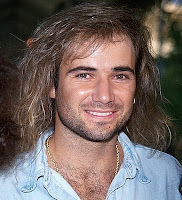 about his infamous on-court tantrums or fights with his first wife Brooke Shields, Agassi frequently appears the prize idiot. That makes the book incredibly fun to read -- and you're willing to indulge Agassi here and there when he makes himself out to look better than he may have deserved. Even so, throughout the book, it seems clear that Agassi's not publishing this book as a testament to his own ego (though, yes, autobiographies are by definition self-serving). Nor is he grinding an axe. Sure, there are the requisite asides about other players he didn't care for, but on the whole, what we have is a rare, riveting and unbelievably forthright glimpse into the life of one of the most beloved American athletes of all time. Don't let the fact that many of the juiciest tidbits were already widely reported deter you from picking up the book. Yes, he used crystal meth on occasion for a brief, particularly rough patch in his life. Yes, his famous 'do of the early '90s was actually a hairpiece. And, yes, he really did hate tennis. And that is the one admission that ties the whole book together. Agassi played tennis the way many of us do our jobs, we put our heads down and go to work, looking forward to those things that make us truly happy. Agassi was no different: As he matured, he found ways that tennis could be a means to an end, like providing money and visibility for his charity that built a charter school in Las Vegas, and finally marrying the love of his life, Steffi Graf (one of the greatest women tennis champions of all time, for those unfamiliar). If I haven't convinced you yet, well, Entertainment Weekly loved it also -- it gave the book a rare A, and installed it on its Top 10 for 2009 Non-fiction. Also, the book has 164 reviews on amazon, 139 of which are five stars. Really, I promise you, you'll like it! I decided I wanted to read this one after reading an article in People Magazine about it. I haven't read it yet but it is in my TBR list. I think I will add this to my TBR, I keep hearing good reviews - even though I wasn't a big Agassi fan (liked Sampras more :) but I always welcome honest memoir. I read Monica Seles' memoir recently which wasn't a bad read - wasn't a big fan (liked Steffi better :) but I like her as a person after reading her book. I am in the Sampras camp but the book sounds interesting! He certainly revealed a lot in the book - around the time it released, sports commentators were remarking on why Agassi would choose to make those revelations now. Thanks for the review! Books as Gifts: Homework over Christmas?